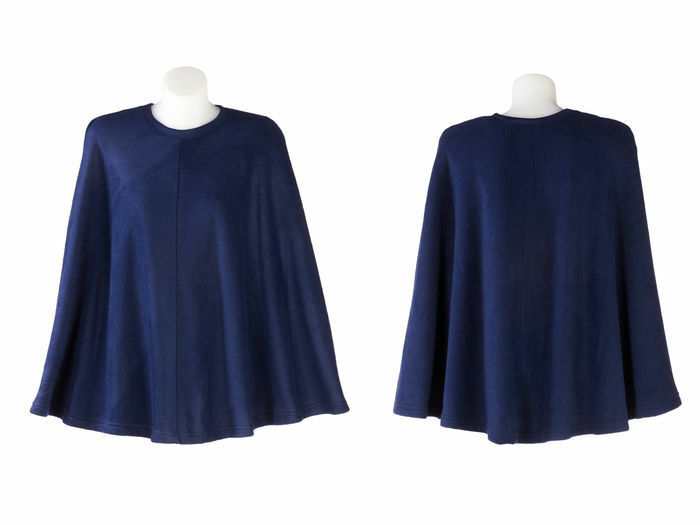 Our lovely soft long poncho is perfect for that little bit of extra warmth when you find it difficult to put on a jacket. It is very comfortable and looks fantastic. Perfect for any weather. These poncho's are very comfortable and look fantastic over our adaptive clothing range including our adaptive nighties, adaptive blouses and adaptive dresses and polos. For comfort we use only soft seams to eliminate scratching or itching on delicate soft skin. Some styles have the tag placed at the hem line for extra sensitive skin. If you need more information or assistance with ordering please feel free to phone us on 0402 075 290 we are happy to help! Fabric Care: Easy care, no ironing required, washes perfectly time after time in aged care & commercial and nursing home high temperature laundries. Shop with confidence knowing that Petal Back Clothing have been supplying quality adaptive clothing to Australian's since 1994. Our products have stood the test of time and are loved by carers, nurses, families and residents of aged care / nursing homes for over 20 years! Designed and manufactured to the strictest standards to ensure consistency is achieved and our customers are continually satisfied. Aged Care Residents, Seniors, Elderly, Hospital, Infirm, Nursing home high care residents, hospital stays, nurse care, assisted living, carer aided dressing, Seated Dressing, People with physical disabilities, Special Needs care, Paraplegia, Quadriplegia, Bariatric people. Also may assist in dressing for those with Alzheimer's Disease, Dementia Patients, Palative Care, Diabetes, MS Multiple Sclerosis, Parkinson's, Shoulder stiffness, Stroke, Polio, Cerebral Palsy, Motor Neurone Disease, Oedema and swelling, SPI Spinal Cord Injury, Brain Injury, MD Muscular Dystrophy, Contractures, Flights, Breast Feeding, Holidays etc.